Editor-in-Chief Dr. Michael Gesin, Worcester State University, USA. Journal of International Relations and Foreign Policy is an international peer-reviewed journal published by American Research Institute for Policy Development. The peer-reviewed content of the journal ranges widely across the whole of International Relations and covers subjects and theories of interest to researchers around the world. It publishes articles on contemporary world politics and the global political economy from a variety of methodologies and approaches. The journal seeks original manuscripts that provide theoretically informed empirical analyses of issues in international relations and international political economy, as well as original theoretical or conceptual analyses. The journal follows double-blind peer review process. Journal of International Relations and Foreign Policy provides an open forum for research publication that enhances the communication of concepts and ideas across theoretical, methodological, geographical and disciplinary boundaries. 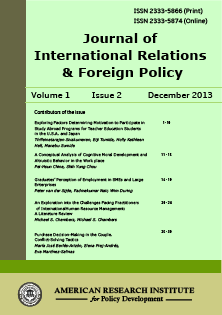 By emphasizing accessibility of content for scholars of all perspectives and approaches in the editorial and review process, Journal of International Relations and Foreign Policy serves as a source for efforts at theoretical and methodological integration and deepening the conceptual debates throughout this rich and complex academic research tradition. Foreign policy analysis, as a field of study, is characterized by its actor-specific focus. The underlying, often implicit argument is that the source of international politics and change in international politics is human beings, acting individually or in groups. In the simplest terms, foreign policy analysis is the study of the process, effects, causes or outputs of foreign policy decision-making in either a comparative or case-specific manner. Each paper published in Journal of International Relations & Foreign Policy is assigned a DOI®number, which appears beneath the author's affiliation in the published paper. Click HERE to know what is DOI (Digital Object Identifier)? Click HERE to retrieve Digital Object Identifiers (DOIs) for journal articles, books, and chapters. Dr. Michael Gesin, Worcester State University, USA. Dr. Francesco Melfi, Cleveland State University, OH, USA. Dr. Shak Bernard Hanish, PhD. National University, USA. Professor Sara Núñez de Prado Clavell, Universidad Rey Juan Carlos, Spain. Danae Hart, Dept. Cultural Studies, of Claremont Graduate University, USA. Prof. Hüsamettin İNAÇ, Dept. of Political Science and International Relations, Dumlupinar University, Turkey. Dr. Huma Baqai, Institute of Business Administration, University of Karachi, Pakistan. Mr. Vladimir Ðorđević, Dept. of International Relations and European Studies, Masaryk University, Brno, Czech Republic. Mr. Lawrence Mhandara, University of Zimbabwe, Harare, Zimbabwe.